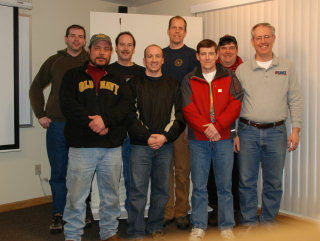 The Granite State Sky Riders was formed in March of 2008, when a group of us were together taking the LSA Repairman Inspection Course in Laconia, NH. A common bond and love of flying was quickly realized, and we decided we needed to share this among ourselves and with others. Founding members from left: Brian Goss, Scott Doughty, Gary Iosua, Chris Davey, Perry Dickau, Brian Thompson, Carroll Werren, with class instructor Roy Beisswenger. Brian Thompson, from the Mount Washington area, threw the winning name into the hat during a break, and thus the Granite State Sky Riders was born. Different from other flying clubs, we are not affiliated with any particular flying organization, we don't have any bylaws, and we don't have dues!! What we do have is a great bunch of people who simply love to fly, and that's what this club is all about. Also, we do not sell aircraft, provide flight instruction, or represent any PPC or PPG manufacturers. If that is your area of interest, please see New England Chute Flyers or Chutesup Powered Parachutes.